A debut health care guide that asserts that physical pain is an epidemic that the medical community doesn’t always appropriately treat. When Cady, a physician, suffered chronic back pain, she found that other doctors’ recommendations and treatments were less than satisfactory. Eventually, she says, she found relatively simple options that could cure her pain without drugs, injections, or surgery. This transformative experience led her to write this book, aimed at a dual audience of patients and physicians. 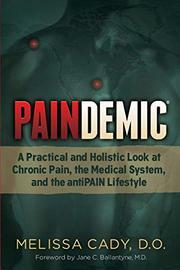 She begins by addressing “the pain problem”: 100 million Americans “suffer from some type of chronic pain.” She then exposes what she sees as the shortcomings of an insurance-driven medical system that encourages treatment rather than prevention: “The reality is our society is continuing to deflect the patient’s responsibility for optimizing health from within while physicians have no money incentive to emphasize the importance of self-care.” Cady takes particular aim at opioids, frequently prescribed pain relievers that she says have potential side effects that may have a long-term, detrimental impact on one’s health. Given recent news stories about widespread addiction to prescription pain medicines, this portion of the book is especially relevant and timely. The author also addresses the potentially negative consequences of surgery. Certainly the most intriguing section, though, is “The Rational Solution: The antiPAIN Lifestyle.” In it, Cady lobbies for people to wrest control of their health away from doctors, because “your personal lifestyle or collection of healthy habits, not outside forces or physicians, will dictate the best health for you in the majority of cases.” That said, her own plan isn’t revolutionary, nor does it guarantee freedom from pain; instead, it includes such obvious guidance as “Quit Smoking,” “Drink Water,” and “Optimize Your Nutrition.” Some technical portions of the book, despite the inclusion of a glossary, may be challenging for the average reader, so it’s appropriate that the author suggests that patients give copies to their physicians to read. However, some of these same medical professionals may bristle at the author’s subjective perspective and counsel, despite copious notes. A scrupulously researched, sometimes-impressive work that offers an impassioned call for self-care and patient empowerment.